Frank Moran & Sons offers the newest and best selling ink dabbers on the market. Available in two sizes: 91 ml. (3 oz.) and 106 ml. (4 oz.) our dabbers come in regular as well as fluorescent colors. 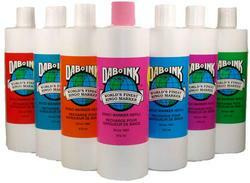 Our dabbers are known for their clean, clear marking ability. As an added bonus we have specialty dabbers available for most major holidays throughout the year. Try our Christmas, Valentines Day or Patriotic dabbers. Other themes are also available in gift packs or by the gross.